eBook HTML and PDF files. 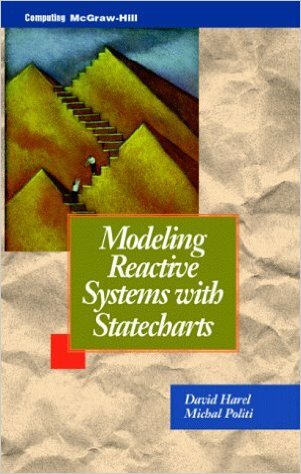 The book provides a detailed description of a set of languages for modelling reactive systems, which underlies the STATEMATE toolset. The approach is dominated by the language of Statecharts, used to describe behavior, combined Activity-charts for describing activities (i.e., the functional building blocks-capabilities or objects) and the data that flows between them. These two languages are used to develop a conceptual model of the system, which can be combined with the system's physical, or structural model, described in a third language-Module-charts. The three languages are highly diagrammatic in nature, constituting full-fledged visual formalisms, complete with rigorous semantics. They are accompanied by a Data Dictionary for specifying additional parts of the model that are textual in nature. Author David Harel invented Statecharts, and he and coauthor Michal Politi co-developed the other two languages in the set. Ms. Politi also headed the Statemate development team for more than a decade. Their work has earned them the Most Influential Paper Award from the International Conference on Software Engineering, and Harel's work on the language of Statecharts has won him the Stevens Award in Software Development Methods in 1996 and the first Israel Prime Minister's Prize for Software in 1997.